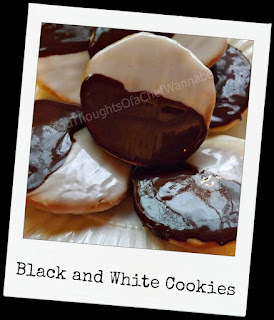 I love black and white cookies. When I lived in New Jersey, I could get them anywhere. When I moved out here to Nebraska, I can go them nowhere. Black and white cookies are a New York thing. North Jersey and New York, I mean, you can get them many other places in the northeast but their popularity "supposedly" started in Manhattan, the Bronx, and North Jersey. This is just from what I have been told and read. So don't sue me if there further history here I have omitted. My goal, when faced with these black and white beauties was to eat it. Just being honest. It was really my only concern. (just ask my chin, the 3rd one back, is made of all black and white cookies). Pffftt. I was in Whole Foods once since my return to the midwest and found a black and white cookie. Now you all know I love my Whole Foods, and Trader Joes, but lets be honest, Whole Foods smells somewhere between a barnyard and rotten feet. I was skeptical how this cookie even made it INTO the place, let alone that it didn't taste like naturally sweetened horse feed. It might explain why I have never seen them there again. So as always, when you can't find something that is pretty regional, in your new city, you make it yourself. And that I did. Black and white cookies have a cake-like consistency and there are so many variations on the icing, poured fondant, etc that, well, it really isn't my main concern. I mean obviously it better be of the "black and white" visual, but the cookie part is where you can NOT mess this thing up. Preheat oven to 350. Line a baking sheet or 2 with parchment paper. In a bowl mix together flour, baking soda, and salt. Now in another bowl or in your stand mixer combine, butter and sugar. Cream together for 1 minutes. 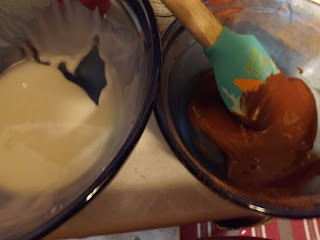 Add in vanilla and the egg, mix until combined. Now add in the flour mixture and the buttermilk alternately, starting and ending with the flour. Mix until just combined so you don't overwork the flour. Using a large cookie scoop, I made 6 cookies. You are welcome to make them smaller, but where I got them they were huge! If you make 6 large cookies, bake them for 13 minutes. 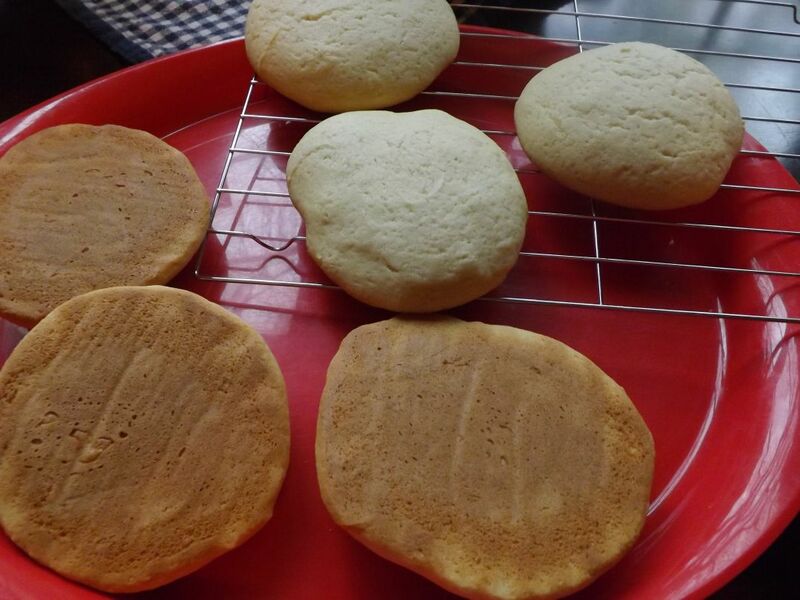 Do NOT overbake them or they will be dry! Let cool on the cookie sheet while you prepare the icing. Combine all ingredients EXCEPT cocoa powder. You may need more or less water depending on how your icing feels. Make sure it is thin enough to be very spreadable. When you have gotten it the consistency you like, divide in half. In one bowl of icing add the cocoa powder and combine. Now, flip the cookies over, because you actually frost the BOTTOMS of the cookie! I know! Using an offset spatula, ice cookies VANILLA ICING FIRST! It is just the rules man, don't ask why. It should take you 2 swipes, one on on the vanilla half, then let them sit 5 minutes. Then the chocolate half. Refridgerate until ready to serve. The corn syrup gives a beautiful gloss to your icing and allows it to set a little bit. There you go, you have the greatest black and white cookie recipe ever. If you want to experiment with icings, that is great, this is just how I do it! I hope you enjoy them, what a great treat, and the cake-like cookie is amazing! I am so in the same situation as you. I grew up with these in New England, in fact they remind me of family. Now that I'm stuck here I can find them now and then at The Bagel Bin, and I always scoop a few up for my kids. Found a recipe once and hated it, SO excited you posted this. Wish it wasn't on the week that my mixer died!